Large Pink Girl Snowman Velvet Stocking 21"
Home > >Shipping Rates & Times< > All Christmas Stockings > Large Pink Girl Snowman Velvet Stocking 21"
Fleece and velvet fabrics and fully lined for the luxury feel and touch. It will last you for a very long time. It is one of our Customer's favorite. Measurements: This Christmas Stocking measures 20" diagonally from the corner where the loop hanger is attached to the toe of the stocking. The width of the cuff is 8.5 inches. Plenty big for lot's of stocking stuffers! 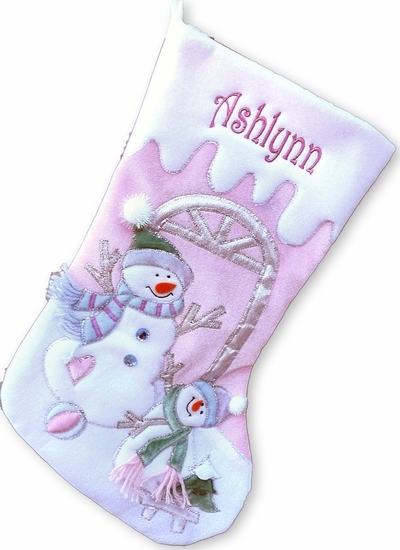 This personalized stocking also matches some of our other stockings that are made by the same facility so you can mix and match from similar Christmas stockings and have them personalized as one group. Lining: Yes, this Christmas stocking is lined inside with fine satin material that matches the color of the stocking. The stocking is also padded inside between the lining and the exterior velvet, which gives the stocking soft feel, it holds its shape very nicely - just a superior quality workmanship! Free of charge, the name is machine embroidered in Block Print onto the white cuff of the Christmas stocking in baby pink metallic thread. On this stocking you can have embroidered up to two lines, for example First Name and Year Please provide the First Name you wish to have embroidered on the stocking, or the name and year in the Personalizing box.